The [obvious] answer, of course, is you can't. This rings reminiscent of when Oscar Wilde sued the Marquess of Queensberry for libel, and found himself in prison in the exchange. The Marquess was telling everyone that Wilde was homosexual, so Wilde sued for libel. Except that by suing, he made the matter of his homosexuality discoverable. So the Marquess' barristers exonerated their client by proving to the satisfaction of the court that Wilde had in fact engaged in homosexual acts and Wilde was sentenced to two years hard labor in Newgate prison. The moral of this story is, never sue anyone for libel when it's you who's doing the lying. A recent study has revealed that the Earth’s natural atmospheric greenhouse effect is around 90 K or about 2.7 times stronger than assumed for the past 40 years. A thermal enhancement of such a magnitude cannot be explained with the observed amount of outgoing infrared long-wave radiation absorbed by the atmosphere (i.e. ≈ 158 W m-2), thus requiring a re-examination of the underlying Greenhouse theory. We present here a new investigation into the physical nature of the atmospheric thermal effect using a novel empirical approach toward predicting the Global Mean Annual near-surface equilibrium Temperature (GMAT) of rocky planets with diverse atmospheres. Our method utilizes Dimensional Analysis (DA) applied to a vetted set of observed data from six celestial bodies representing a broad range of physical environments in our Solar System, i.e. Venus, Earth, the Moon, Mars, Titan (a moon of Saturn), and Triton (a moon of Neptune). Twelve relationships (models) suggested by DA are explored via non-linear regression analyses that involve dimensionless products comprised of solar irradiance, greenhouse-gas partial pressure/density and total model is found to statistically outperform the rest by a wide margin. Our analysis revealed that GMATs of rocky planets with tangible atmospheres and a negligible geothermal surface heating can accurately be predicted over a broad range of conditions using only two forcing variables: top-of-the-atmosphere solar irradiance and total surface atmospheric pressure. The hereto discovered interplanetary pressure-temperature relationship is shown to be statistically robust while describing a smooth physical continuum without climatic tipping points. This continuum fully explains the recently discovered 90 K thermal effect of Earth’s atmosphere. The new model displays characteristics of an emergent macro-level thermodynamic relationship heretofore unbeknown to science that has important theoretical implications. A key entailment from the model is that the atmospheric ‘greenhouse effect’ currently viewed as a radiative phenomenon is in fact an adiabatic (pressure-induced) thermal enhancement analogous to compression heating and independent of atmospheric composition. Consequently, the global down-welling long-wave flux presently assumed to drive Earth’s surface warming appears to be a product of the air temperature set by solar heating and atmospheric pressure. In other words, the so-called ‘greenhouse back radiation’ is globally a result of the atmospheric thermal effect rather than a cause for it. Our empirical model has also fundamental implications for the role of oceans, water vapour, and planetary albedo in global climate. Since produced by a rigorous attempt to describe planetary temperatures in the context of a cosmic continuum using an objective analysis of vetted observations from across the Solar System, these findings call for a paradigm shift in our understanding of the atmospheric ‘greenhouse effect’ as a fundamental property of climate. 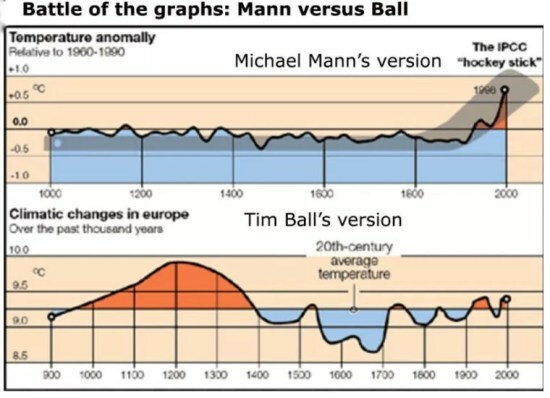 That is, the adjusted data used by alarmist organizations like NASA, NOAA, and the UK Met Office differs so markedly from the original raw data that it cannot be trusted. This chart gives you a good idea of the direction of the adjustments. he blue bars show where the raw temperature data has been adjusted downwards to make it cooler; the red bars show where the raw temperature data has been adjusted upwards to make it warmer. Note how most of the downward adjustments take place in the early twentieth century and most of the upward take place in the late twentieth century. What this means, the report concludes, is that claims by NASA, NOAA, and the UK Met Office that the world is experiencing unprecedented and dramatic warming should be taken with a huge pinch of salt: they all use the same corrupted global average temperature (GAST) data. Another perfectly good fallacy shot to hell. In this instance, "a massive jet of warm air" is penetrating north, sending a cold burst southwards, said Dr Meyer, who has relocated to Hobart to research on the southern hemisphere, and is hosted by Australia's Integrated Marine Observing System.